Why am I online? After spending an entire day online, I should have no desire to be in front of the computer. However, that seems to be the only form of entertainment I have left now. No there are other forms of entertainment. But when you reach home after a particular point, there is no energy left to do other ‘work’ nor do you feel like going to bed so early like one should. Which leaves the computer and its various forms of entertainment… movies, surfing and more. But today, right now, I am wondering when was the last time I wrote. Like really really wrote. Not blogging, not aimless articles. Fiction. Poetry. Ramblings. The creative process. Maybe I do really need a break. Life sometimes is like balancing on the fine edge of a knife. Not the cutting end. That tip, which is the most painful when pressed against your skin. It breaks your skin so minutely that the drop of blood which glistens seems beautiful, instead of showing the pain it does. And sometimes, winds blow against you, trying to push you off the knife and you try to stay there, despite the pain. Do I sound morbid and incomprehensible? That is mostly how I feel right now. How did I cruise 25 years to come to this point when I feel I am caught in a storm? There have been times of trouble… several. But it was one issue at a time. And so, there could be one part that was calm and rational. Ironically, people have been saying that I’ve been quiet and calm the past few days. Well, some do say that I’ve been too quiet. But I guess that is because I am trying not to think about anything in particular. The fear, the anxiety and the sheer nausea the thoughts bring… I cannot handle it alone. There is a niggling question in the back of mind which tries to keep clawing out – what is this isn’t a temporary thing? I mean… the very foundations on which I stood are moved right now. The things I thought I wanted to do … the places I thought I wanted to be… the person I wanted to be… the people I wanted to be with… some of them aren’t happening, I don’t want some of them anymore. And that changes the dimension of my existence in a really scary way. Year ago, I watched a movie. It is actually a short film directed by my dad’s friend. It was about this guy – who is mostly shown walking around parts of Bangalore, drinking coffee with someone in an outdoor cafe (was that the press club?) or standing on the balcony – watching people or the sky – during a party. And every now and then, they showed a clock, connected to a home-made circuit. I guess it is like a time bomb which was set to go off… only a matter of time, not sure when. After the screening, my family and me debated about what the movie meant. We found it a little stupid (it wasn’t that well done, to be honest). And the time bomb conclusion was what we came to. And over the years, my mind kept going back to it and I figured it would explode when the person could no longer handle the changes around him. I am not very receptive to changes. As versatile and curious as I am, I prefer my home base (as I call it) to remain steady. It is a cocoon to which I can return to when the world grows too strong. Am I just 25? I feel much older sometimes. 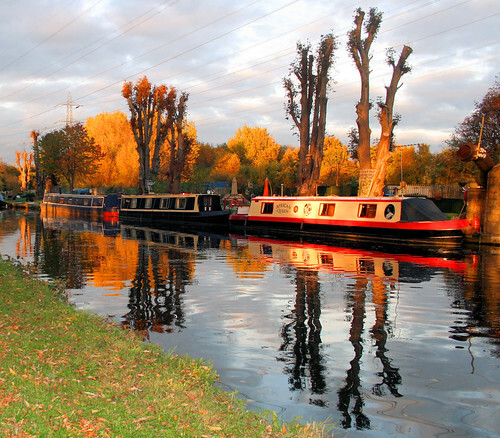 Barges on the Lea Valley, originally uploaded by Jahina. A saturday that did not start past noon. A saturday that was not spent sleeping away. How rare is that! And how much fun is that! As much as I love late nights and say that I am productive in the wee hours of the night, I have to accept that I get a lot of the more practical stuff done during day time. I had an early meeting (past noon but hey!) which meant I woke up early. The sun was already burning up all those people on the street… I prayed for rain and wished there was something I could wear on my face to keep that sticky dirt off it. Or maybe attach a little fan to my head that will keep blowing cool breeze onto my face. In the end I was just glad that there were no mirrors around me to see how tanned and yucky my face got. And this was just the beginning of the day. I had to visit an old friend who works for a local magazine. I had been there during college days – more than 5 years ago – and honestly, not much has changed. I guess that is what “long-standing” means sometimes. The walls were still faded and finding the new wing was still as confusing. But once you get past the confusing door, the office had been upgraded into the 21st century. It isn’t as chic as my office is… nor was there as much a bustle. Contrary to popular belief, a lot of the news paper offices I’ve visited recently are quiet. Is it because all the reporters have been laid off or is it because they are all just out, I don’t know. But those days when I did my internships (here and in Australia) where the office was cramped and you’d be huddled away typing out your story, is history. The desks though are still the same cluttered. Clippings, magazines, coffee cups and photos lying in a uncomprehensible jumble. It feels like home – almost. But the curious lack of chaos was a little disturbing to me. I wondered if I were working there, would I last? Lunch was at Oye Amritsar – a dhaba-like place, with 5-star restaurant prices. And Himmesh Reshamaiya music. Yep. But I had a craving for butter chicken since last night and since I hadn’t eaten anything, I figured this would be a good place. I mean if you can’t trust a dhaba (or a mock one at that) to come up with good butter chicken, who else can you trust. Except, once we settled down, the waitress told us that there was no a la carte menu. Only buffet. Now, I’ve nothing against buffet. But for people like me, who don’t eat much to start with, it is a sheer waste. And I get confused with the whole range of food, end up wanting everything and just take a bite of it all and get quite full. And the buffet did NOT have butter chicken!! What kind of a self-respecting dhaba does not serve butter chicken? Or at least chicken tikka masala. Or some form of recognized, popular chicken curry. They had fish fry, panner, some weird named dish and that was that. My friend was enjoying the restaurant though. She, who I shall call Kit (cuz I feel like it) has a sheer appreciation of any place that we go to. The last time when we went to this restaurant that is styled like a 40s luxury railway dining car, she was excited like a little kid. Enough to make the host appreciate us and give us an inner ac table. So Kit served herself as little food as me and we wished there was better music and better food but we were starved enough to eat quietly. It was Kit’s day to treat herself – she wanted to a haircut, so after being refused at several salons because we didn’t have an appointment… (Side note: seriously, an appointment for a hair cut as well?! What is this city coming to. True, you are supposed to get better service if you make an appointment. But it is a saturday. there are emergencies – sometimes. Every place I know and like said they were booked till late evening. Surreal!) we found one place that was willing to chop off her hair. I hate it when parlors do that… you go there to relax and let someone pamper you and they start forcing unwanted products on you. Which is why I like Bounce. Snobbish as they may be, they never mess up your hair and they never offer products to you unless you ask for a recommendation. And then there was that impulse shopping – I wanted an iPhone. I have finally gotten over all my objections and figured I wanted one. I don’t need a new phone. My current one is fantastic and has all those things that an iPhone has. But I wanted an iPod, since I sort of washed my last one in the washing machine. And I figured why carry two things when I can combine that into the iphone. So that graduated from an ipod nano to an ipod touch (free wlan and radio and FB and all) to iPhone. The iPhone is gorgeous! it is heavier than mine and apparently I need a data plan to browse the net. But it is gorgeous. And it is a lot more delicate than my phone which I have already dropped several times and it still works fabulously. But it is the iphone. And it is expensive. and I don’t really need it but oh! i do want it! And I don’t really have the money for it! So debating with all of this stuff, I figured I better look into my financing options (and wavered on that bit a little too when I saw the little “EMI” option there. I’ve never really bought anything on EMI. Always hated owing someone anything but it was quite tempting) I headed to Mocha to think. Mocha – the hang out for college kids, who get money from god-knows-where. When we were in college, our hang out was a little 5-rupee tea shack. We could sit there for hours, smoke, talk and the guy wouldn’t say a thing. And we’d be poorer by say 10 bucks or a little more. Which wasn’t much but was all we could afford. Now the kids have money to pay 150 bucks for a single coffee. Where do they get the money from? And how are they sitting there in the afternoon when the colleges insist on 90 percent attendance? But hey the music was good. The sheesha was good. The company was good. Kit’s appreciation of things puts a completely different spin on the places I’ve gotten a little jaded about. It is new for her and she loves it. And it reminds me of those times when I was all so excited about these places. The times before my friends started calling me a snob because I wanted to try out these new places and not all of them were cheap. Before they started complaining about the “kind of crowd” in the place. It is good to discover this city… showing someone the places that made Bangalore “Bangalore”. The city has changed… the little icecream shop where we used to buy cones in school no longer exists. Road sides are littered with vendors with the backdrop of bigger malls. And boring old factory-manufactured clothes! But with new people to see it with, it is fun to discover the little signs of old Bangalore still alive like the rose bushes in Mary’s secret garden. The Gypsy said to the… whoever. Such a cliche I start out with. I hope that isn’t an indication of the way this blog turns out to be. The blog is perhaps a sixth attempt to break away from my old blog and start something afresh. But I am an addict. I always return to the old one, with a plain template, with old stories, faithful followers and friends. Maybe it is the last that pulls me back… I like the cloak of anonymity but I like the familiarity of people who’ve been reading me long enough to know me in a strange and twisted way. Do I have the energy to maintain two blogs when I do not really have anything new to say? Perhaps. Will I put up with the slowness of wordpress compared to the slightly old and molding Blogger? A lesser perhaps. But it is a new year. I hope this year will be better than the last, which was… bland. Not high. Not low. Just a flat line. So maybe it is time for some fresh things. And while I enjoy this cloak of anonymity for a while, I’m just going to let myself loose.